Just a quick reminder that Dean & Britta are playing in London for the first time in over two years tomorrow (Wednesday) night. 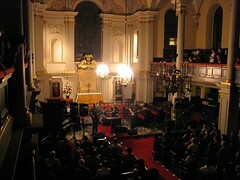 The show takes place at the very lovely St Giles in the Fields church just off Tottenham Court Road. Tickets are £12 and are still available from wegottickets. The promise is that Dean will be raiding the back catalogues of both Galaxie 500 and Luna for this show as well as that of Dean & Britta of course! Support comes from (Double Feature recording artist) Cheval Sombre who will be joined by Sonic Boom (Spacemen 3/Spectrum) and most probably by Dean & Britta. Doors open 7pm and curfew is 11pm. * Off topic: The above picture is of the wonderful The Clientele playing at St Giles a couple of years back - if you're at a loose end on Thursday The Clientele are holding the UK launch of their album at The Luminaire.